BAGHDAD (Reuters) - Two of Saddam Hussein's aides were hanged before dawn on Monday, the Iraqi government said, admitting that the head of his half-brother Barzan Ibrahim al-Tikriti was also ripped from his body during the execution. On the defensive after international uproar over sectarian taunts during the illicitly filmed hanging of the ousted president two weeks ago, government spokesman Ali al-Dabbagh insisted there was "no violation of procedure" during the executions of Barzan and former judge Awad Hamed al-Bander. But defense lawyers and politicians from Saddam's once dominant Sunni Arab minority expressed fury at the fate of Barzan, Saddam's once feared intelligence chief, and there was also skepticism and condemnation of Iraq's Shi'ite-dominated government across the mostly Sunni-ruled Arab world. Barzan Ibrahim al-Tikriti is Saddam Hussein's half-brother, and his wife is the sister of Saddam's first wife, Sajeda Kheit Allah. 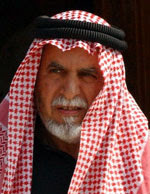 However, disputes emerged between the Iraqi president and his half brother that surfaced in 1983 when Barazan was the chief of intelligence. The president removed his brother to outside the government until 1988 when Barazan became Iraq's representative at the UN in Geneva. As the Iraqi ambassador to the UN in Geneva, he had responsibility for the regime's finances abroad. Barzan has pushed a claim to succeed Saddam against Uday and Saddam's younger son Qusay. His evident reluctance to return to Iraq at the end of 1998 put him under the spotlight of suspicion, and he has been interrogated at length by Qusay. By mid-1999 the tide had turned against Barzan as Saddam's immediate family has accused him of plotting to overthrow the regime. Those charges may have caused Barzan to briefly flee abroad before returning to Baghdad. On 27 December 1999 Iraqi President Saddam Hussein granted high medals to his three half-brothers in their first public meeting in two years. Several medals went to Barzan Ibrahim El-Hasan al-Takriti, Iraq's former permanent delegate in the European headquarters of UN in Geneva,who was granted five bravery medals and two high medals of merit. Medals also went to Watban Ibrahim El-Hasan al-Takriti, the former minister of interior who was granted the bravery medal and the high medal of merit, and the third half-brother, Zabawi Ibrahim El-Hasan al-Takriti, was granted the bravery medal. 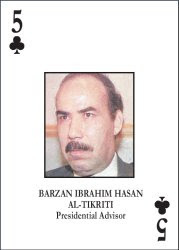 Barzan Ibrahim Hasan Al-Tikriti was taken into coalition custody April 16, 2003, during a raid in Baghdad. Awad Hamed al-Bander was chief justice of the Iraqi Revolutionary Court and is now 60 years of age. According to the indictment, he conducted show trials which often lead to summarydeathsentences.Al-BanderpasseddeathsentencesonmanyShiitesfromthevillageofDujail. The events in Dujail started to unroll on 8 July 1982 when Saddam Hussein visited the Shiite town to meet with tribal leaders. Dujail was a stronghold of the Shiite Dawa Party which carried out terrorist attacks in Iraq to protest against the war with Shiite Iran. The Dawa party wanted to assassinate Saddam Hussein to avenge the execution of one of its founders. When Hussein’s motorcade entered the city, the Dawa members opened fire. A four hour battle ensued. Saddam Hussein was saved by soldiers and army helicopters. He is said to have assured that there would be no retaliation. However, the secret service soon went into action: the town’s fruit plantations were destroyed and nearly 150 people killed. The youngest victims were 13 years old.